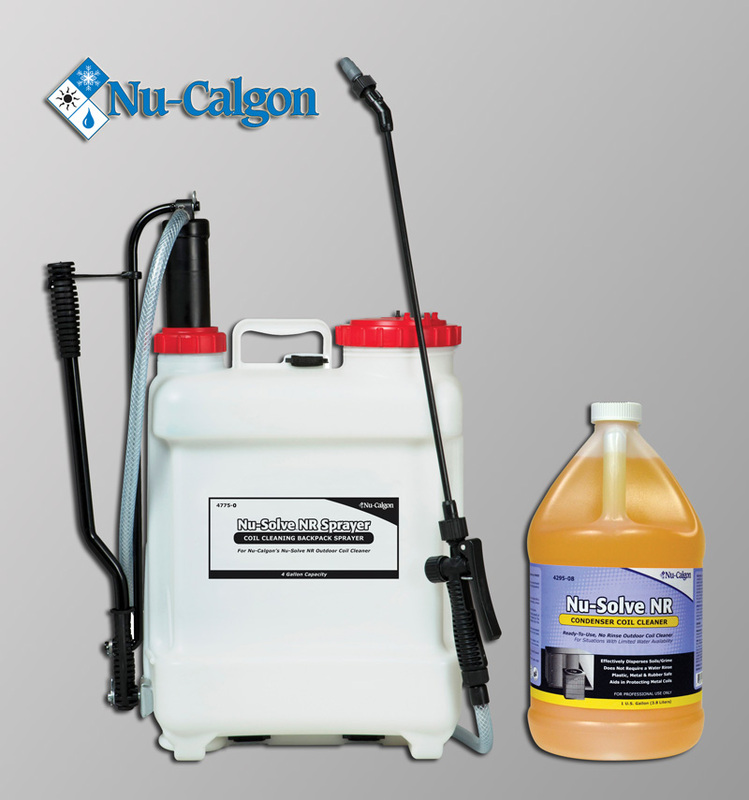 The Nu-Solve NR Sprayer is a versatile applicator designed exclusively for Nu-Calgon’s Nu-Solve NR. The backpack sprayer is designed with a durable, UV resistant, high density polyethylene four gallon reservoir with no holes or connections to leak! The large graduated tank includes an internal pump and provides long lasting pressure between pump stokes. The sprayer includes a big mouth tank with strainer for faster, non-splash filling. The Nu-Solve NR Sprayer is ruggedly constructed with reinforced hose and flexible wand and adjustable nozzle. The sprayer includes padded, adjustable shoulder straps and a convenient carrying handle. The Nu-Solve NR Sprayer is designed solely for use with Nu-Calgon’s Nu-Solve NR (4295-08); an non-rinse outdoor coil cleaner when water access for rinsing is an issue. A few applications for Nu-Solve NR include cell tower cooling coils, multistory building where outdoor water access is not nearby, cleaning a residential condensing unit when the outside facet is turned off, and/or when a contractor prefers to have a smaller chemical footprint on the roof when cleaning commercial systems. IMPORTANT: Nu-Solve NR is the only approved coil cleaner to be used with the Nu-Solve NR Sprayer. Not for use with other Nu-Calgon coil cleaners or competing cleaners. Nu-Solve NR can also be applied with a conventional tank sprayer. 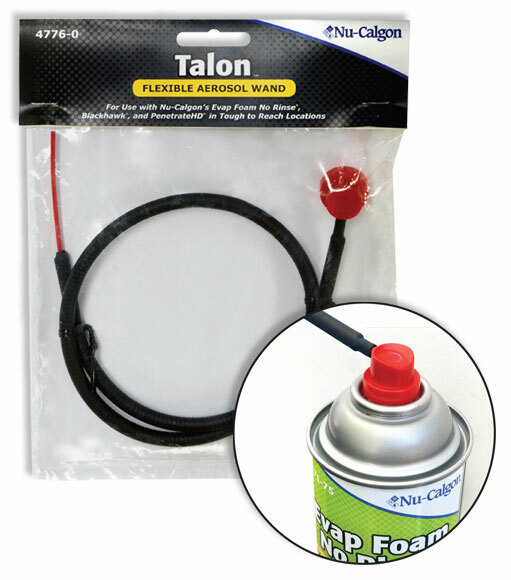 Nu-Calgon’s Talon tool flexes into spaces where a bulky aerosol can can’t reach, and it sprays with greater precision and less waste. It can easily reach inside a coil to spray from the inside out; or it can flex around obstructions to treat tough-to-reach locations. To install, simply remove the existing spray nozzle from the aerosol can and attach the Talon on top (make sure you wear protective eyewear and gloves and follow the instructions on the Talon package). Once armed with Talon, precise control is within your grasp! PurCool Green strips and tablets prevent slime and sludge build-up in air conditioning and refrigeration condensate drain pans. They utilize unique, environmentally friendly plant based suspending and dispersing action to prevent build-ups, overflows, and odors in drain pans. When placed in the drain pan, PurCool Green will slowly dissolve in the condensate water providing preventative treatment for 4-6 months. PurCool Green does not contain any harsh chemicals or biocides, making them safer for the user and the environment. Use in all A/C air handlers, fan coil units, window units, mini splits, and refrigeration condensate drain pans. Place the PurCool Green strips or tablet in the condensate drain pan away from the drain opening. When drain pan begins to collect condensate water, the PurCool Green strips or tablet will adhere to the pan, begin to slowly dissolve and provide treatment. PurCool Green will not float or move in the drain pan and over time, the PurCool Green will completely dissolve with no housing or sock left behind. When the product is no longer visible, it is time to replace the strip or tablet. Wait a minimum of 5 minutes before equipment start-up. Eliminates odors caused by smoke, mold, mildew, stale air, sewer gas, pets, and more. Works great with heating ventilation and air conditioning systems. ClenAir Original Odor Neutralizer, as well as CherryAir and OrangeAir Odor Neutralizers, are unique odor neutralizers, not a perfumes or cover-ups. They eliminate unpleasant odors from the air, neutralizing those caused by smoke, mold, mildew, cat litter, and pets, as well as the noxious smells created by formaldehyde hydrogen sulfide and other chemicals. ClenAir Odor Neutralizers are used by hospitals, nursing homes, hotels and many other businesses. They can be used in homes, basements, locker rooms, cars, boats, and any other space that needs refreshing, and come in a variety of sizes. Use one to two pounds of ClenAir Odor Neutralizer for every 400 square feet. Invert tub and allow product to slide out onto lid while removing container. Save container for future transport of storage of product. Place near source of odor. Larger sizes are available for use in HVAC systems. Use 1 pound per ton of A/C.